Once you have booked your Oahu vacation rentals and your flights it will be time to start planning what you’re going to do when you arrive. If you are a lover of water sports you will no doubt love your time in Oahu simply because there is so much to do. Run by ‘We Go’ and offering canoe rides, and some scenic paddle adventures, the Island Canoe Tour is one that’s not to be missed. Hop on a canoe or an outrigger canoe, and see how beautiful the islands are for yourself. Explore some of the world’s most famous beaches, and head to the Mokulua islands before coming across the incredible Diamond Head, Hawaii’s volcanic crater. While you’re on your Island Canoe Tour you will also come across what is known as the ‘Secret lagoon’, a truly remarkable place that you need to visit. Paddle out to some of the islands and ride a few waves, take a short hike to a tide pool and enjoy a swim in paradise! If you want to spend some time on just one tour, this is the tour you need to go on. Run by ‘Big Kahuna’ and definitely worth a try, the scuba diving experience is a lot of fun. You do not need to have any previous experience scuba diving, as you will be taught everything you need to know. All the necessary equipment will be supplied, and your guide will help you make the most of your time. Dive down into the clear blue ocean, and meet some of the creatures that call Oahu their home. Make your way down to as much as 20-feet, and see the occasional octopus, turtles and if you’re lucky some rays. If you have an underwater camera it’s well worth taking it with you as you’ll no doubt have some great shots to take. Otherwise, simply listen to the guide’s instructions, and make sure you have a wonderful time scuba diving off the coast of Oahu. If you’re feeling a little fearless and you want to enjoy a bit of a wild ride, you may want to think about visiting the Hawaii Water Sports Center. Located at 7192 Kalanianaole Hwy, Koko Marina Center, Honolulu, Oahu, the center offers you the opportunity to enjoy a spot of scuba diving, snorkelling, paragliding, parasailing, and much more! If you’re feeling brave enough you may also want to go for a tube ride which consists of you and a friend being pulled along on a rubber tube while a boat takes you across the water. You might want to give a bit of parasailing a try and enjoy the magnificent view of the islands while you’ll pulled by a speedboat that’s making its way across the clear blue sea. If you’re not feeling brave enough to go parasailing you could always try your hand at a spot of jet skiing. Get a few safety instructions from an experienced guide, and enjoy making your way along the water at your own speed. The Hawaii Water Sports Center offers so much to everyone and you need to visit at least once during your time in Oahu. If you can, please bring a camera with you so you can take a few pictures while you’re parasailing. Alternatively, you could always ask one of the guides to take a few shots of you while you hold on tight to the parasail or rubber tube! Are you a bit of a budding surfer? Would you like nothing more than to learn how to surf on one of the world’s most famous and most beautiful beaches? If you would, you need to enjoy the Catch’a Wave experience. Whether you have a lot of experience surfing, or you’ve never even attempted to use a surfboard before, you will be given all the guidance and instructions you need to head out onto the waters. Head to the North Shore, and be on the lookout for someone who is offering surfing lessons. There is no guarantee as to which beach your lesson will take part on so you may need to do a spot of searching. As soon as you come across a guy in shorts who happens to have at least 6 surfboards with him you’re good to go. No matter how old you are, or how nervous you are, you can enjoy a spot of surfing, and see how you come up against the waves. 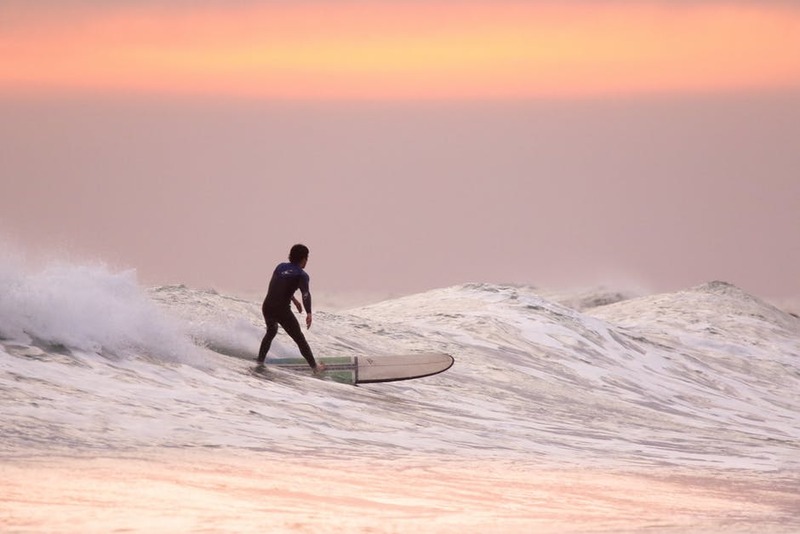 Oahu is the ideal place to learn how to surf as the waters are usually perfect and a good temperature too. Set that budding surfer free, and try your hand at surfing, you never know, you may discover a hidden talent! If you are determined to have a great time while you’re on vacation in Oahu you need to enjoy some water sports. Learn how to surf, paddle your way across to another island in a canoe, and take a parasailing lesson if you dare. There really is a lot to do in Oahu, but the above water sports are some of the best activities out there, give them a try and make your vacation one to remember.